Hello MoFoers! 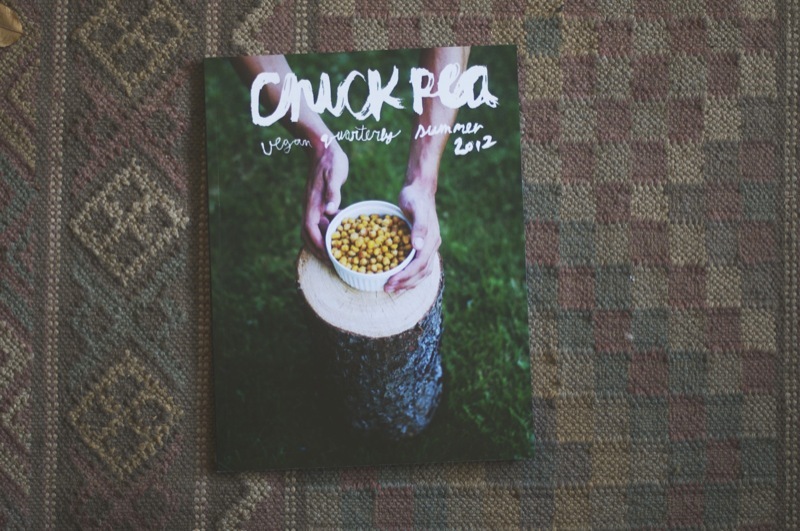 Have you heard of Chickpea Magazine? If not, you are in for a treat. Chickpea is an all-vegan magazine featuring delicious recipes, gorgeous photography, and fascinating articles from volunteer contributors. Look, I’ve worked for a (different) vegan mag, and I can say that without a shadow of a doubt, Chickpea is awesome. There might even be a Chickpea-sized morsel of sadness missing in your media life if you haven’t yet uncovered this hip publication full of vegan wonders. But we have you covered. Chickpea has generously offered two issues of the magazine (one of the summer ’12, and one fall ’12) to two separate lucky US residents. Sorry internationals! We have done our best at MoFoHQ to open many giveaways to non-US residents this year (believe me, because I do not reside in the US and there are MANY giveaways I would have loved to entered had I not been obviously affiliated with the organizers). Anyway, we don’t need you to post this to Twitter/Facebook/Pinterest/email it to your grandma or anything like that to enter. Simply comment on this post and I’ll pick the winners randomly by November 2. Which is soon, so comment away! This entry was posted in Uncategorized and tagged chickpea, chickpea magazine, free stuff, giveaway, vegan, vegan mofo. Bookmark the permalink. I have not heard of Chickpea Magazine. Just followed the link, and it looks fantastic! I’d love to win Chickpea magazine. I like chickpeas, I like magazines, and I especially like that the two ideas are being combined to name a new vegan publication! Love the magazine, really nice design and originality. chickpea magazine is the best thing to happen since herbivore was in print! I saw this at our local VegFest. I’d love a copy or two! Would love to curl up with this magazine & a hot cup of tea! This magazine looks awesome, I’d love to win a copy! Just found out about it, and we are already in a full-fledged love affair. I love Chickpea Magazine. It’s more like a beautiful coffee table book. Happy World Vegan Day!! I just discovered Chickpea Mag last month and am in LOVE with the originality & creativity of both the recipes and the design. As a vegan designer, I would love to get my hands on an actual copy! Ooh I’m still transitioning for to a plant-based diet and would love inspiration wherever I can find it! I love that there is an alternative to the other veg magazine! I have tried some of your recipes, and they were a hit with my friends! I’d love to have a copy so that I can get the full Chickpea experience! It’d be so cool to win this! love it – fingers crossed! Just checked out the website! Awesome magazine. Hope I can win!!! I have wanted to get my hands on a copy of this magazine for so long!! I follow Chickpea via Facebook and would love to see an actual magazine! This is a great publication – one that any curious cook would love. A great gift idea as well! Chickpea magazine is definitely a heavy weight that can compete against other big health food magazines in my eyes. I love that they emphasize cooking from scratch since most people have some degree of disconnection from their food. And c’mon, the streamlined design makes opening an issue an even more delightful experience! hello hello! i would absolutely love a copy of your magazine! i think it is so very original and has a great outlook! Chickpea is my favorite! It’s obviously very thoughtfully put together and always a pleasure to read. I’d love to finally get my hands on a print copy! Beautiful, I’d love to win a copy! I’ve only ever read it online and would love to have a copy! 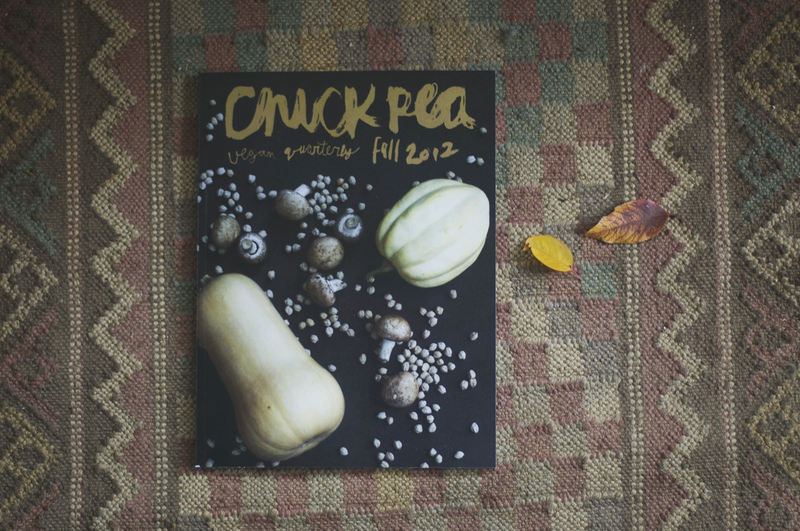 Chickpea is a beautiful veg magazine. Ahhh I would love to win this. Chickpeas are amazing, I’m so glad I discovered them when I became a vegan. The covers are so lovely! I’d love to win one! Ah! So excited for this! I love Chickpea magazine and its creators!!! Love your Chickpea Magazine! Would be AWESOME to read it on paper! Love & light (and happy VEGAN DAY! ), Paula! The cover is gorgeous! I imagine the inside is full of beautful photography and tasty recipes. Can’t wait to get my hands on one. beautiful! i’d love to win a copy. 🙂 Looks like a great magazine. this looks fab! the cover photography of both is beautiful. I love Chickpea magazine but did not get the summer issue! I would love it! The summer issue was fantastic! Great articles and lovely photography! Since I’ve acquired some health issues that have made it nessasarey for me too go vegan, i have been searching for all the info i can get my hands on to live a healthy, happy vegan life. And i think your magazine may just help with that! I’m newly vegan (3 weeks!) so having a copy of Chickpea magazine would give some great recipe ideas! Oooh, this looks fantastic! I’d love to get a copy! I am extremely interested in vegan cooking and would love to have this magazine for recipes. They’ve featured my art in this issue, they are wonderful people indeed! This looks like a great magazine, I’d love to win one! Haven’t heard of the magazine, but I’m up for any vegan magazine! This would be awesome! I’m a fan of Chickpea and all it entails. Wow. I would so love a copy of Chickpea!! I’ve been craving one for so long, but my wallet continues to beg me not to. Looks great, I want to win! It’s my veganniversary today! I want a copy! Ugh. I want this so badly. I would love a copy as well; it is an awesome magazine. i like reading so yay! I’m so glad I found this link. I hope I win! Love what Chickpea Mag is doing. It’s creative meets health conscience and that’s pretty unique in the food/print industry. AND this all bodes well for me hopefully seeing I just bought a gigantic butternut squash the other day and have no idea what to do with it…YET. I love Hipsterfoods and Sewindie, I would love a copy of this magazine! Yay for Chickpea! and for Vegan mofo! I would like to win one of the magazines. I follow one of their blogs. They seem interesting. I’d love a copy. It would totally make my day! love chickpea magazine! a physical copy would be great. Wow! Chickpea is so awesome!! It would be amazing to actually hold a copy in my hands! It would make me very happy if I win a copy! This is beautiful! I would love to win a copy so I can get food ideas as a poor college student living on pizza and ramen. I would love to win Chickpea Magazine! I have always eyed Chickpea but haven’t picked up an issue yet. I would LOVE to win! The pictures are so beautiful! I would love to get my hands on this magazine! I love Chickpea Mag! I’ve always wanted to buy one but, being a broke college student, haven’t found the money yet. I’ve been dying for this for a while now. Oh, VeganMoFo, you’re spoilin’ us silly. Rochester New York Represent! Tasty local food = one of the best things EVER!! I’d be ecstatic if I won. oooh, i’d love a chance to win! I would LOVE to have one of these beautiful magazines! Chickpea is a great magazine, I’d love a copy of this! I would LOVE to have this magazine, oohh I hope I win!!! Always looking for a great food magazine after changing eating habits a year ago. Bye Bye – 50 pounds. Would love to be able to find this magazine in Florida -have looked high and low! Wow, those magazines look great. Thanks for the chance to check out Chickpea! Wow, nice offer – thanks for the chance to win. I’d love to receive a copy! Great offer. I would love a free issue! I’ve been seeing the hipsterfood folks advertising Chickpea mag since its inception but I’ve never been able to purchase one. I’d love to finally get one, to love and to cherish! Discovered Chickpea at the same time I discovered I had missed their Kickstarter. Would love a copy; it’s gorgeous! I love Chickpea Magazine! I’d love to have a real deal copy! Been a fan of Chickpea since their second issue! Its an amazing mag, wonderful design and I love the photography… Don’t even get me started on the recipes!! Previewed the summer issue over at issuu.com, and was absolutely blown away. It’s a beautiful product with incredible articles and recipes. Would love to have a print edition of anything they’ve got. I love Chickpeas! Pretty sure I would love the magazine too!! I Definitely want one! These magazines look and sound great! Too late? Or still time? I found Chickpea online a short time ago and LOVE it! When will it be in local bookstores? So hip and so tasty! I have been wanting to check this out for a while! i LOVE chickpea magazine for the food, the art…everything. if only i could hold it in my hands! A couple years ago I would have had no idea what chickpeas were like. Now they are a favorite ingredient thanks to my wife! It looks great this magazine! Since I’ve just started to have Meatless mondays on my blog this could give me a lot of inspiration. I love chickpea, especially the photography. Wow! Thanks for such a great giveaway. I would certainly love a print version of this beautiful, beautiful magazine. I love the chickpea magazine so much! I’ve only been able to read it online but I’ve always wanted a paper issue, they look so beautifully printed! I kick myself for no supporting this on kickstarter! I love this concept! pure beauty in sweet simplicity! WOW! This looks amazing. Would absolutely love a print copy! Looks great! I’m really excited for it, great present idea too.